Editor's Note: To mark the 40th anniversary of the beginning of China's reform and opening-up, China Daily is featuring a series of stories on grassroots newsmakers. This is the first in the series. 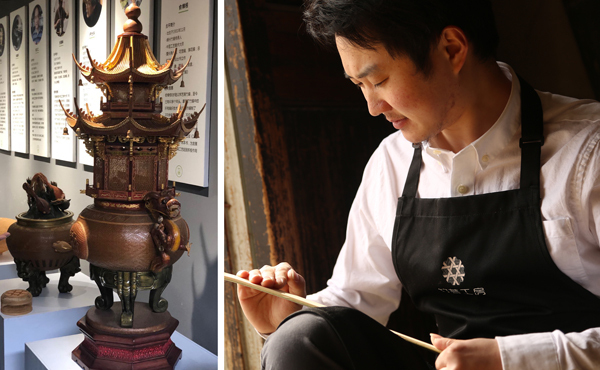 For bamboo-weaving craftsman Qian Lihuai in Wuzhen, Tongxiang of Zhejiang province, the internet has not only affected the way he lives but offered a golden path to revive the traditional bamboo handicraft that has been passed down for hundreds of years. Bamboo weaving in Wuzhen can be traced back more than 500 years. In 2016, it was listed as an intangible cultural heritage in Zhejiang. Qian's father, Qian Xinming, is an officially recognized inheritor of Wuzhen bamboo weaving, and has been practicing the craft in this ancient water town for 40 years. At the age of 20, the younger Qian, then a sophomore in college, started a systematic study of the craft, choosing to devote himself to the traditional weaving art world to revive the family business. He visited neighboring Shengzhou, Anji, Dongyang and Wenling to learn the vanishing weaving skills and became apprenticed to Hu Zhengren, a renowned bamboo weaving master in Dongyang. Upon graduation from Zhejiang University of Science and Technology in 2010, Qian, despite strong opposition from his family, came back to his hometown, Wuzhen, and founded Zhuyungongfang, a bamboo art studio dedicated to the bamboo arts and weaving skills. But what propelled Qian's success was the World Internet Conference in Wuzhen. China's famous antique collect and dealer Ma Weidu visited his studio during the first session of the conference in 2014 and bought bamboo craft items worth 20,000 yuan (,900). During subsequent conferences in 2015 and 2016, Qian's works were displayed at the conference venues, focusing international attention on the craft. Qian currently runs an online store selling bamboo-related items, and has a public WeChat account to promote the craft through online classes. More than 1,000 people participate in each class. "It's a strong medium for publicity," he said, adding that it has become a vital channel to inherit and promote traditional Chinese arts and handicrafts, and offering a path to their revival. Wuzhen's administrative overseer, the city of Tongxiang, has spared no effort over the past five years to protect ancient Chinese culture in innovative ways. Since 2016, the city has sponsored three intangible cultural heritage showrooms, including the traditional blueprint cloth, silkworm products and bamboo artwork. "We believe the internet will help traditional Chinese handicrafts such as bamboo-weaving take off and fly higher," said Chu Hongbin, director of the Center for the Protection of Intangible Cultural Heritage in Tongxiang.